Redesign the Career Navigator Tool to help job-seekers more explore technology employment opportunities in their local communities and quickly connect to training resources. Redesign the Community Playbook Tool to help better support community leads and partners seeking to implement a TechHire program chapter in their local community. A redesigned Career Navigator and TechHire Playbook tool, supported by user research and analysis, and future testing recommendations. TechHire is an initiative created by the Obama administration to push more tech jobs to middle- and lower-class Americans. TechHire is currently comprised of 51 states, cities, and regions across the country who, through civic aggregation, are working to build an ecosystem where governments, employers, training providers and other stakeholders work together in collective action to achieve a unified goal – developing a pipeline of diverse, non-traditional talent to meet employers’ rapidly growing IT demands. 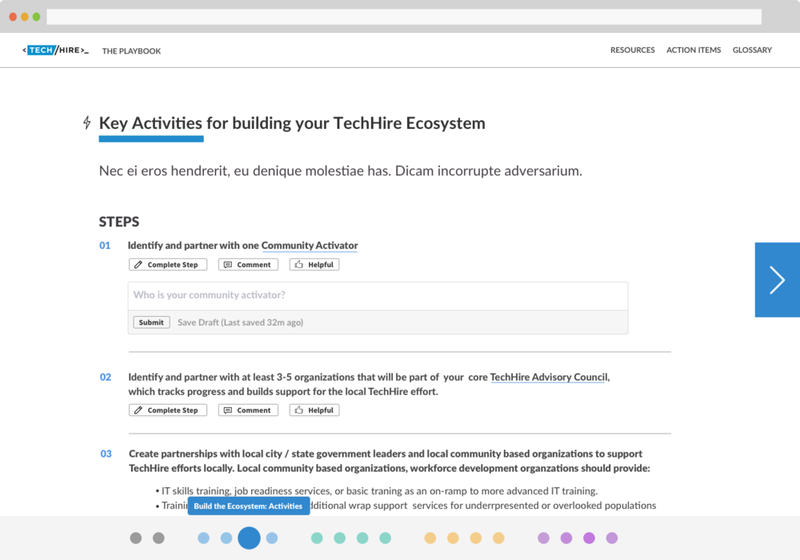 TechHire needed an improved tool to help TechHire Community Leaders access critical resources to successfully launch and sustain a TechHire Community. 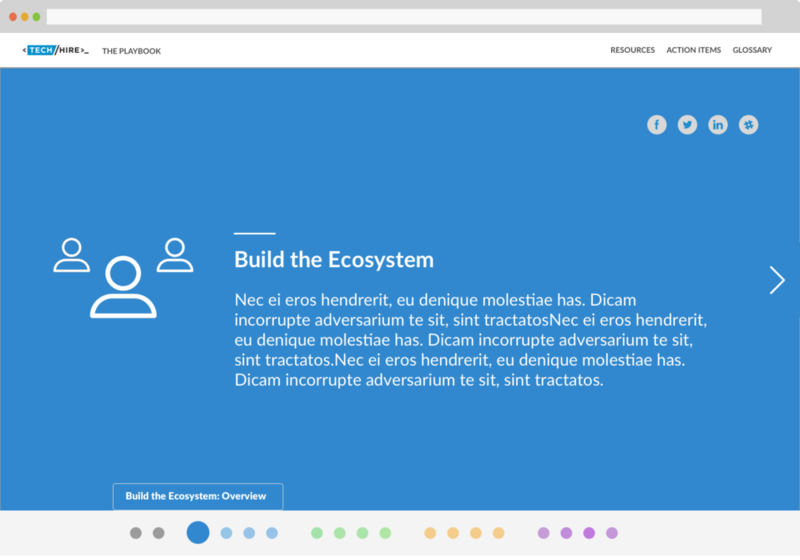 The new redesign needed to make it easier for community leads to contact the organization, understand the community on-boarding process, track their progress in real-time, and access curated resources such as presentation decks and strategy guides. I worked with the TechHire team and Community Leads to gather insights into user needs. We learned that it is important to give TechHire community leaders easy access to the TechHire staff if they had questions. Flow allowing TechHire community leaders to quickly access tools and resources at any point in the implementation process. Introduction page for each stage of the TechHire community implementation process. During the research process, we learned that TechHire community leaders aren't always familiar with specific organizational terms. We learned that TechHire community leaders didn't simply want a list of a steps but a place to keep track of their progress in real-time. In addition to provuding actionable steps, we learned that it is important to give TechHire community leads immediate access to key, curated resources such as presentation decks and strategy guides. 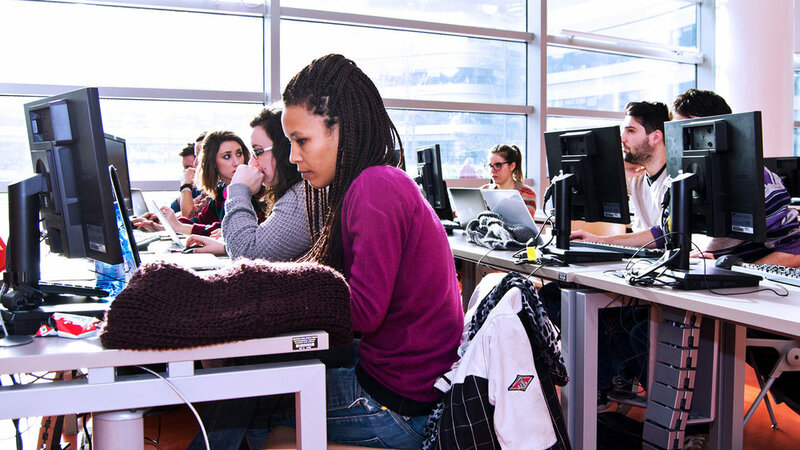 The TechHire Career Navigator Tool is designed to help city residents explore technology employment opportunities in their local communities and to connect them to training resources.